We’d make new dresses for our dolls. And I remember one spring, somebody taught us how to make little tiny kkaakene (“boots”) like this and meendaage (“mittens”). 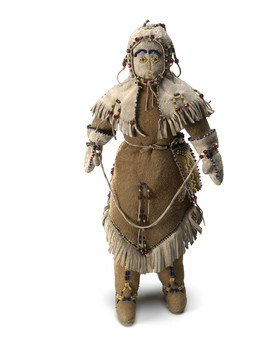 This Tanana girl’s doll wears traditional men’s clothing – a pointed tunic, hood, gauntlet-style mittens, moccasin-trousers, and knife sheath. Girls sometimes made their own dolls out of cloth and stuffing, using braided grass for hair. They learned to tan skins and sew by working on new clothes for their dolls. Eliza Jones: Oh, that’s a neat one. That’s a really neat one, very detailed. . . . Well it says “costumes.” They might have made this for the collector maybe. Maybe they requested it, because there’s a knife case and these mittens. Eliza Jones: Actually, this [mittens] string is supposed to go behind [the neck]. If a guy was using it, he wouldn’t let it hang. It would be behind him. Trimble Gilbert: You’re still making that kind of doll sometimes? Eliza Jones: Yes, there are people who make these dolls, but dressed different. Judy Woods: I just try to make parkees [parkas] and fur boots. Eliza Jones: Edith doesn’t really sew that much anymore because of her health and stuff, and her eyes aren’t that good, but she used to make dolls like this. And she carved the face out of . . . k’aalt’oodze’ [tree bark]. Eliza Jones: T’egheł lot’oodze’ [cottonwood bark]. Judy Woods: That’s right, cottonwood bark. Eliza Jones: They’re thick, but they’re easy to carve because they’re soft. So she would make the face out of that kind. But this looks like the traditional parka. Eliza Jones: If it was in winter, these mittens would have lining in it. Eliza Jones: And these things [upper area of mittens] are on here to keep the wind off your wrists. Eliza Jones: I’ve never seen a man wearing this kind, this cape like this on a hat. I don’t know. Aron Crowell: That’s a kind of clothing we haven’t looked at in the collections, a kind of hood with a cape. Judy Woods: I’ve seen a woman dressed up like this but not a man. Judy Woods: But Nenana always have this style in their pictures. Eliza Jones: This style parkas. Judy Woods: Yes, and then the boots. Aron Crowell: But what about the knife case? Is that specific to men? Eliza Jones: Yes, definitely. Definitely, women wouldn’t’ wear a knife case like that. Judy Woods: A needle bag [laughs]. Aron Crowell: But you didn’t play with any dolls that were kind of like this one. Eliza Jones: Well, there was some dolls that was made of cloth. Judy Woods: We made our dolls too. Eliza Jones: And then my friend Marie Yaska and I, every week we—oh, and materials was so hard to find. Eliza Jones: Sometimes the women sew, but they don’t want us to touch their material. They’re called seedets [calico]. And one time they give me a big piece, it was about this [sheet of paper] big, and I didn’t want to cut in to it. And I had that piece of cloth for a long time. But we’d make new dress every week or so. We’d say, “Let’s change our clothes,” and we’d make new dresses for our dolls. And I remember one spring, somebody taught us how to make little tiny kkaakene [boots] like this and meendaage [mittens] and other clothes. And I guess that’s a way of learning how to sew. Same thing with fish net. The fish net was real small mesh, and again, our parents wouldn’t let us use the real twine. . . .